The Allied Telesis MWS Series are cost-effective wireless LAN Access Points (APs). The MWS Series has three models, to provide a superior solution for any small to medium network installation. 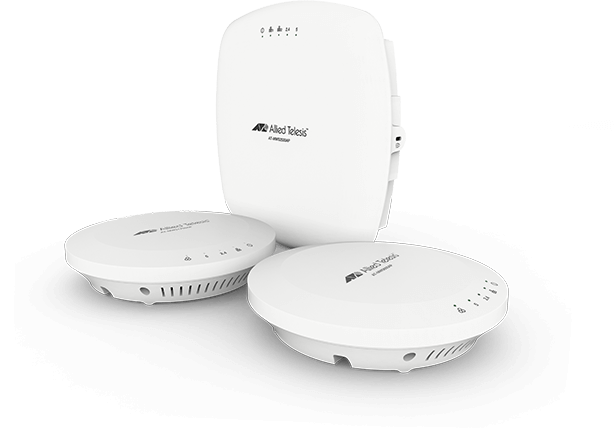 The MWS Series wireless APs support IEEE802.11a/b/g/n or IEEE802.11a/b/g/n/ac. Dual-band support utilizes the 2.4GHz and 5.0GHz frequencies at the same time. The MWS Series is equipped with advanced encryption and authentication IEEE 802.11i capabilities. These APs protect WLANs by segmenting public and private access with multiple Service Set Identifications (SSIDs) and VLAN Tagging. Rogue AP detection prevents unauthorized entry to the wireless network. MWS600AP supports two IEEE802.11n spatial streams, with throughput of 300Mbps in the 2.4GHz band and 300Mbps in the 5GHz band. MWS1750AP supports three IEEE 802.11n/ac spatial streams, with throughput of 450Mbps in the 2.4GHz band and1.3Gbps in the 5GHz band. MWS2533AP supports four IEEE 802.11n/ac spatial streams, with throughput of 600Mbps in the 2.4GHz band and 1.7Gbps in the 5GHz band. The MWS Series prioritizes connection to the 5GHZ band wherever possible, to minimize interference with the busy 2.4GHZ band. It is possible to activate/deactivate SSIDs and restart APs with automatic scheduling. Clients connecting to an AP where signal strength is low can be forcibly handed over to an AP with a stronger signal.